First - King Edward Point and a Bull Elephant Seal showing his battle scars. There is abundant wildlife in South Georgia and it is a joy to watch. The birds and animals have no need for fear of humans. As long as one does not get too close, most of the birds and animals are content to carry on as normal and share their time and space with you. 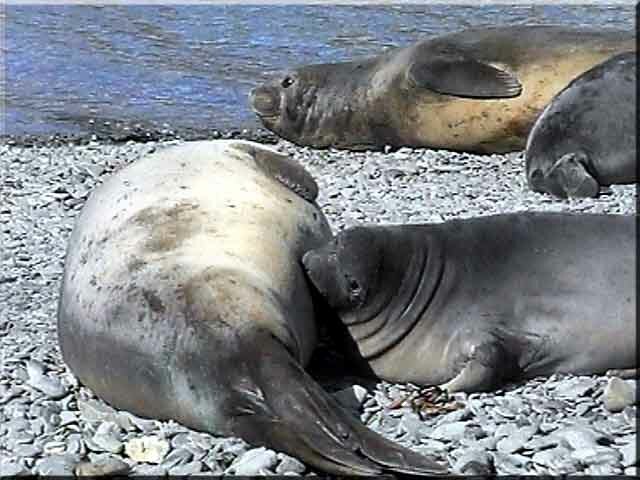 There is a fair sized colony of Elephant Seals at King Edward Point and the bull above was dominant. There were a few females suckling young and a half interested Skua stepped his way through the group. 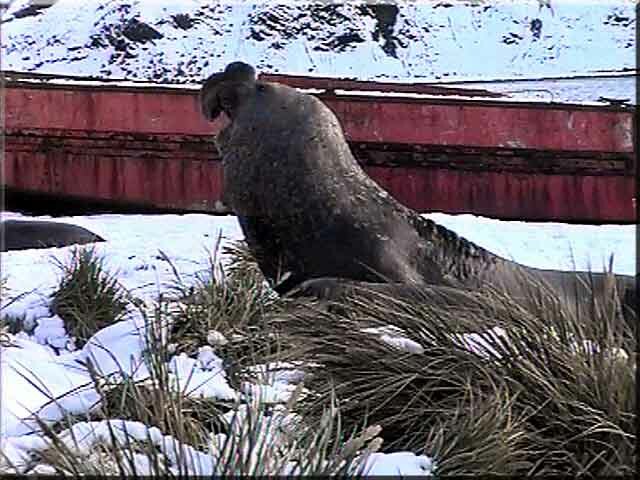 A Snowy Sheathbill was, as usual causing havoc among the seals tormenting them mercilessly, especially this bull. The males are not normally aggressive towards humans, but another male is a different matter. 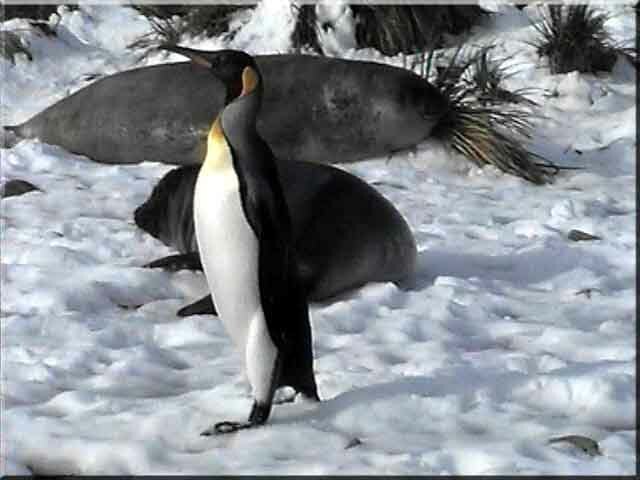 There are usually a few King Penguins also, but very seldom have I seen Gentoo Penguins coming ashore here. 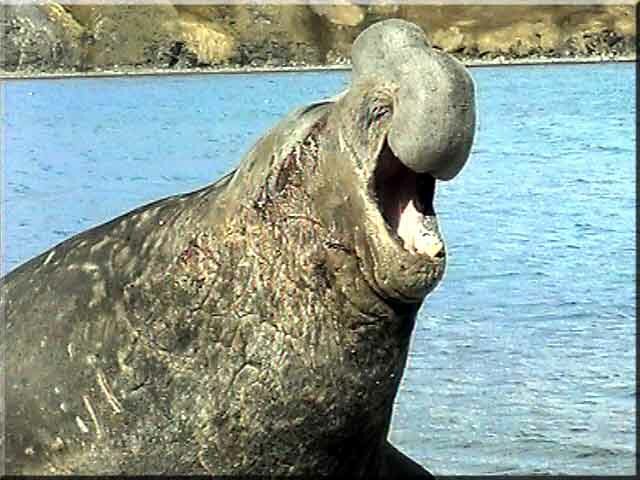 I had been sitting with These Elephant Seals at K.E.P for some time, when the bull started to rear up and roar. At first I though he had taken offence with me, and was prepared to run, but then saw the sheathbill that had started pecking at his scars and running away. He had recently been in a fight with another bull as can be seen here. This was not the first time that I had observed the Snowy Sheathbill torment Elephant Seals like this. The bull started to chase the bird down the beach, having no chance of catching it. He was very angry indeed. This picture was taken by the jetty at King Edward Point. 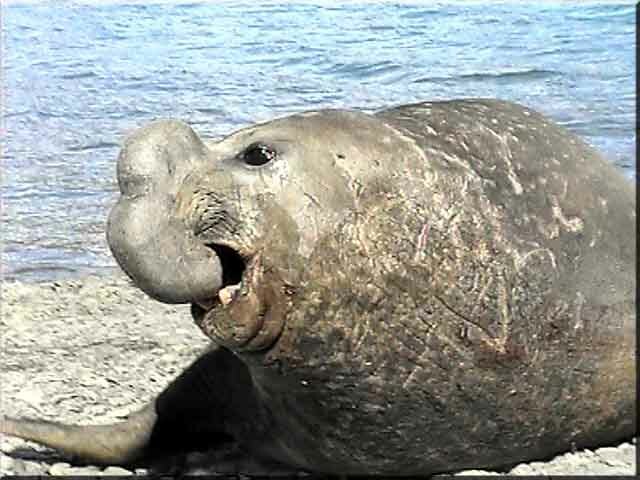 Some of the local garrison were working nearby and it caused the Elephant Seals no concern whatsoever. At the landing craft this bull had spotted a young male coming to his beach. He roared at the young pretender and they briefly faced up to each other. The younger bull then fled obviously in awe of his larger relative. 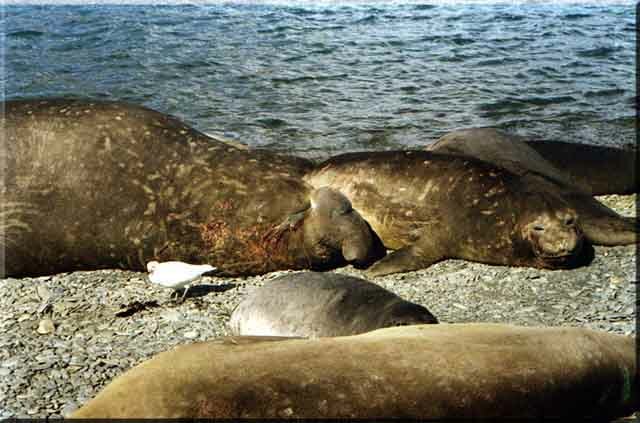 A female Elephant Seal suckles her pup at the King Edward Point colony. As the pup suckles, an Antarctic or Brown Skua shows a casual interest. 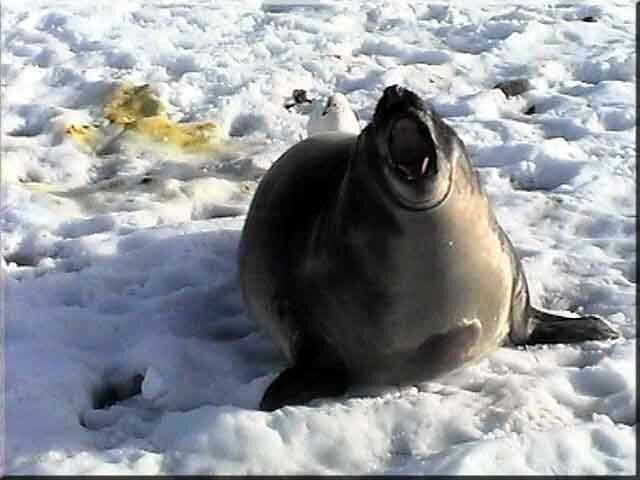 An Elephant Seal pup is picked-on (literally) by a Snowy Sheathbill at King Edward Point. 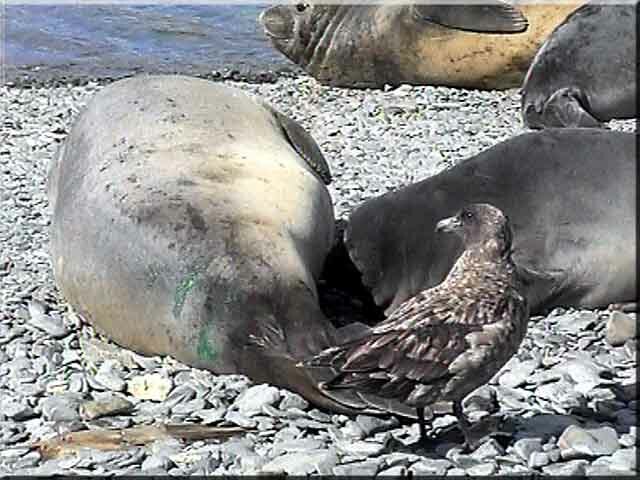 Every time it tried to relax and sleep the Sheathbill would run in and peck at it's tail. It was less than amused as can be seen here! It went round and round in circles trying to shake off it's tormentor. 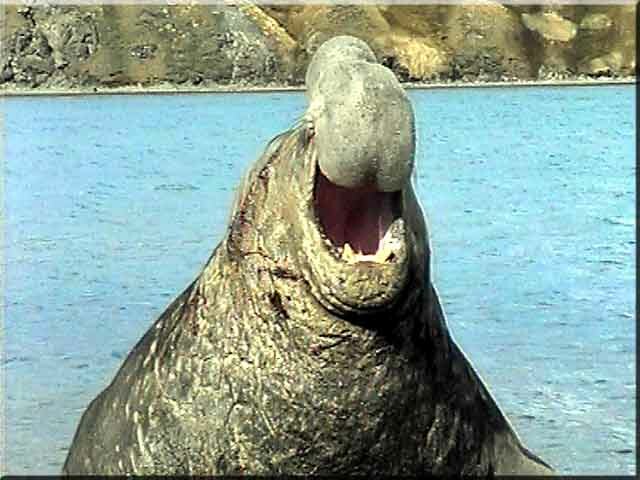 In the centre left is the cause of many an Elephant Seal's misery. The Sheathbills continually harass the seals by pecking at their wounds. 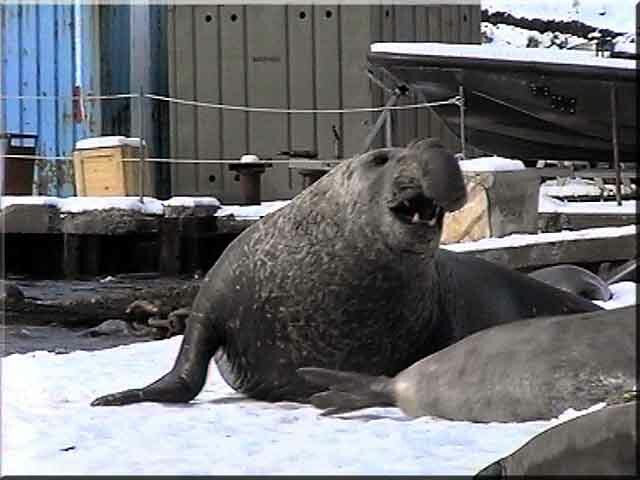 Often they appear to do it for devilment and if there is a commotion in a colony of Elephant Seals - there is sure to be a Snowy Sheathbill around. A King Penguin walks past some young Elephant Seals at King Edward Point. 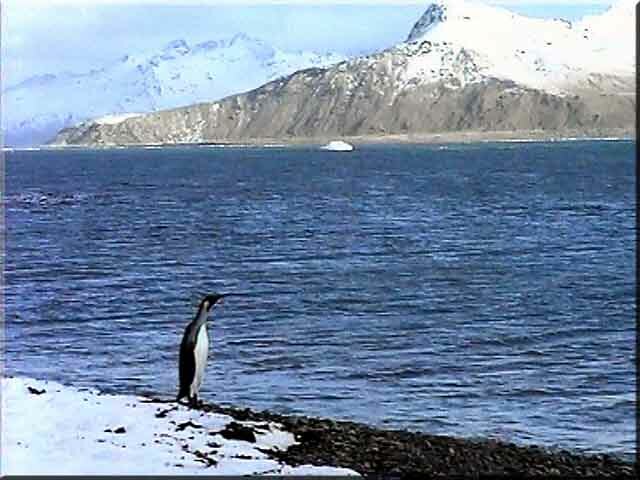 A solitary King Penguin looks out over the Cumberland East Bay from King Edward Point.